Assange was taken into custody at a central London police station, and the arrest was made at a US extradition request, the Met Police have confirmed, saying he will appear at London Magistrates� Court. 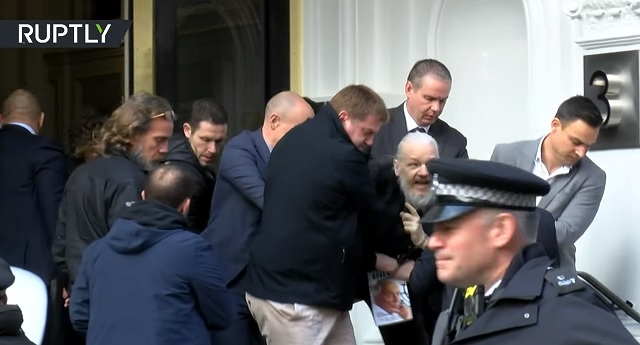 Julian Assange has been �further arrested on behalf of the United States authorities after his arrival at a central London police station,� the Metropolitan Police confirmed. The US cited the Extradition Act while filing the request, they informed. "Ecuador's Foreign Minister has announced that the country has suspended Wikileaks founder Julian Assange's Ecuadorean citizenship, which he was granted at the end of 2017," RT reported Thursday. The media, who has spent the past three years whining about Trump's attacks on the press, will now cheer Assange being arrested for publishing evidence of war crimes and exposing criminality in the US government.